A fleet of low-emission buses is to serve serve the route, Leeds City Council said. 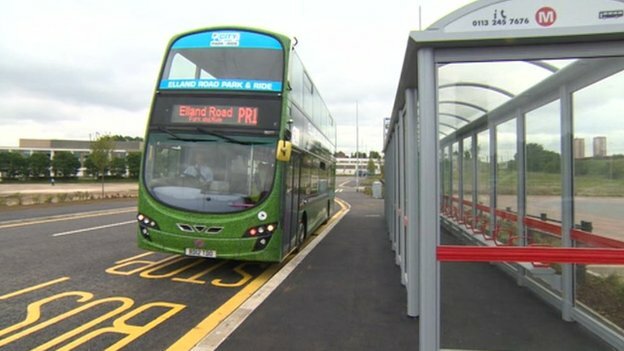 Work has finished on Leeds' first large park-and-ride scheme in time to be used by visitors to the Tour de France. The 800-space scheme at Elland Road is to open at 07:00 BST on Monday, providing a shuttle into the city centre. A fleet of low-emission, WiFi-enabled buses will serve the route, Leeds City Council said. Buses are to run 10 minutes from 07:00 to 19:00 Monday to Saturday, apart from Leeds United's home fixtures. Electric car drivers can also make use of five electric-car charging points. A bus priority lane at Junction 3 of the M621 means buses using the site should not have to queue in traffic. Another larger 1000-space park-and-ride site has been proposed for the Aire Valley Leeds enterprise zone, the council said. It is expected to be ready for operation by late 2015. The Tour de France, the world's biggest cycle race, is to start in Leeds on Saturday 5th July. The first stage of the race will take riders from Leeds city centre to Harrogate. The second day of the race will start in York and end in Sheffield.